AWS Identity and Access Management (IAM) is a web service that helps you securely control access to AWS resources for your users. You can specify permissions to a single user or you can use groups to specify permissions for a collection of users, which can make those permissions easier to manage for those users. Furthermore, you can use a Role to grant authorization to AWS resources without any credentials (password or access keys) directly associated with it. In this Lab, we allocate time to learn the recommended AWS security best practices. Paolo Latella is an AWS Community Hero, Cloud Solutions Architect and AWS Technical Trainer at XPeppers, an enterprise focused on Cloud technologies and DevOps methodologies. 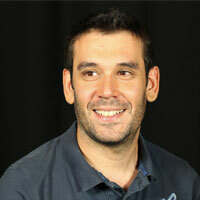 Paolo has more than 15 years of experience in IT and has worked on AWS technologies since 2008. Before joining XPeppers he was a Solution Architect Team Leader at Interact, an enterprise leader in Digital Media for the Cloud. There he followed the first Hybrid Cloud project for the Italian Public Sector. Paolo hosts regular meetings as the Co-Founder of AWS User Group Italia and AWS User Group Ticino. He can also be found participating at various technology conferences in Italy.